Mobile Learning Communities (MLCs) are groups of learners that are engaged in online, e-learning or m-learning often referred to as distance education. The idea of m-learning is that the student’s device is indeed mobile whereas e-learning may confine a user to a desktop without the same type of mobility. New mobile devices are being released faster and faster in a manner that redefines how the user receives information. The learning students receive in a mobile learning community transfers over to real world use of digital devices in both their personal and professional lives. Mobile Learning Communities (MLCs) offer personalized learning, anytime, anywhere on any device. With the power of technology in business those that are digitally literate will undoubtedly become more secure in their jobs and careers. We are asking leaders and thinkers in education and technology fields to educate America out of a fixed skills mindset and into a growth mindset of jobs that cannot even be imagined. Students have access to unlimited information, rather than memorize and recall information we must now teach them how to analyzed and access information for the global world in which they live. The buzz words of “globally competitive” are ever evolving into “globally collaborative” as the digital age breaks down international barriers that once were. The opportunity to learn is afforded by mobile technologies. Learning can happen anytime, anywhere. The exponential growth of wireless and mobile networks has brought vast changes in mobile devices, protocol development, standardization and network implementation, and user acceptance. No longer is the learner confined by the walls of a classroom. More and more colleges and even high schools are being swept into virtual education making the learning experience more accessible and convenient as well as less costly. When school becomes less costly and more convenient, the more we can educate our world offering endless opportunities for all. A hybrid of traditional face-to-face learning coupled with mobile learning provides the learner access to a teacher facilitator as well as instant access to information. The best mobile learning systems should use both instructional and informational approaches. Classrooms should focus on information as well as instruction. Technology is key, yet challenges are more likely to be in content, strategy, and transformational change. The impact technology has on teaching and learning is significant. Learning today is driven by the need to make connections and to collect and apply knowledge in a variety of ways. Students must interact with information in a variety of modalities, have opportunities to respond to the information and receive prompt feedback. Technology, with the direction of a teacher, will provide the gateway students need for this interactive, 24/7 learning experience. This ensures each student has a personalized education and access to information so they may engage in their own learning process while pursuing their dreams and future aspirations. Technology is ever-changing. Educators must make a commitment to recognize, accept, and adapt their teaching to providing the best innovative tools, while staying abreast of new technologies to support their curriculum and engage all student learners in this transformative Information-Age. Digital learning must also include a non negotiable commitment to citizenship in a digital world. Digital responsibility and cyber safety are two key areas for the Digital Learners. Ensuring students understand and are provided with curriculum to make a positive digital social contribution is important and worth a sustained dialogue integrated into all curriculum areas. Palloff, R.M., and Pratt, K., Building Learning Communities in Cyberspace: Effective Strategies for the Online Classroom,Jossey-Bass Inc., Publishers, San Francisco, 1999. Preece, J., Online Communities: Designing Usability and Supporting Sociability, Wiley, John & Sons, Incorporated, New York, 2000. Schoenholtz-Read, J., and Rudestam, K.E., Handbook of Online Learning: Innovations in Higher Education and Corporate Training, SAGE Publications, Thousand Oaks, 2002. Sharples, M. (2005). Learning As Conversation: Transforming Education in the Mobile Age. BYOD is a phenomenon that exists in business and education. 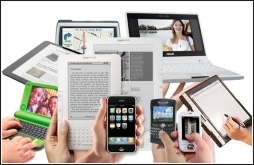 In education BYOD is reshaping the way IT is purchased, managed, delivered, and secured. It is proving to be a cost effective way of getting digital devices in to the hands of the learner while allowing the user to access the school's network. Students are allowed to bring their own digital device as a learning tool. The school requires devices to be configured with passwords, prohibits specific types of applications from being installed on the device and may require all data on the device to be encrypted. This is simply an effort to ensure student fidelity to the learning. Other BYOD security policy initiatives may include limiting activities that students are allowed to perform on these devices at school with periodic IT audits to ensure the device is in compliance with the school's BYOD security policy and COPPA rules and regulations. 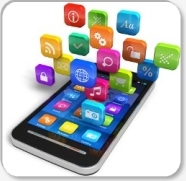 Responsible use guidelines and policy are of utmost importance for BYOD to be a success. While the most visible component of 1-1 initiatives are providing a wireless computing device for every student and teacher, this initiative also addresses pedagogy, technology infrastructure, policy, professional development, community engagement, funding, and organization as necessary components of a sustainable model for supporting college and career future-ready students in the United States. The digital transformation is one of the tenants of a larger strategic plan to ensure that students are prepared for bright and prosperous futures as they are exposed to rigorous and relevant instruction in every classroom, everyday. It is designed to transform the instructional delivery of content, information and resources in our schools. The decision to move forward with a digital transformation should be grounded in research, partnerships with other school districts and extensive front-end work utilizing a researched framework. Distance learning provides an online exchange which affords students the opportunity to enroll in courses at campuses all across the world. Barriers such as distance, age, and time are broken down so that learning is available at the touch of a mouse. There is an appetite for online learning. Online classrooms are becoming a distinct part of college life while also being offered as commonplace at some middle and high schools as well. While learning online doesn't replace the relationships that can be built in the traditional face to face classroom, it does provide many learners an alternative. In “most” cases, online classes are asynchronous. You can log in anytime and from anywhere to complete your work and participate in classroom activities, just as long as you complete all your work by the required deadlines. With commitment to scheduling and focus online can be a more than satisfactory alternative to the traditional classroom model.